Strand Craft V8 Wet Rod. It’s wet and its hot! You must have heard countless times from the majority of people that money doesn’t bring you happiness. We are also among those people who support the exact same thing. However, we might all have to agree that money does buy you a Jet Ski. Have you seen anyone sad on a Jet Ski? That could have been the suitable moto of the company Strandcraft which is one behind the development of the Strand Craft V8 Wet Rod. An amazingly looking Jet Ski which is able to bring tears of joy to the driver only by looking at it. (Man up, don’t cry!). If you are a Jet Ski fan (but really, who isn’t) and you want to get the Ferrari of waves, there is really no question here. Just go and get it! Speaking of Ferrari, which one is faster? Unfortunately, you can drive the Strand Craft V8 Wet Rod only in water. I know, it’s a bummer and a deal breaker for many. However, you can keep your Bugatti at the marina waiting for you to finish taming the waves and as soon as you are done from your ride with your stunning Jet Ski, you hop on your hot wheels and off you go to your Hollywood party. Talking about performance, this awesome Jet Ski is more powerful and faster than many cars. It’s got a top speed of 65Mph (gee…) and a V8 5,7 L 300Hp Engine…. Definitely faster than my bike and more powerful than quite a few supercars. Apart from the amazing performance, it does come with some comfort features such as a waterproof luggage box for your tuxidos, ice box under seat to prepare your cocktails, a sound system for your favorite tunes and a GPS navigator so you don’t get lost with all this speed. 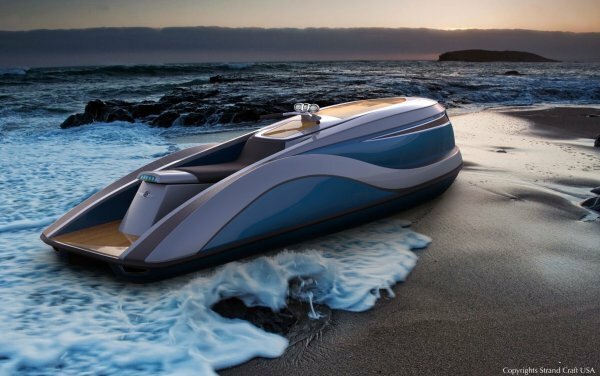 It kinda sounds like the Jet Ski that even James Bond would beg Q to develop. OK Sailor, Wrap it up! With prices starting at US$49,000, is definitely much cheaper than what you paid for your supercar or for your recent yacht acquisition. Want more info? You can always visit Strandcraft and request further details. How did you like it? You might want to check out a few of our suggestions below. You like fancy stuff? Maybe you can read more about Vessyl. How about you also check some of the most awesomely creative dresses?